JNVST 6th Class Results for Navodaya Selection test 2019 – 2020. Check District wise entrance results in jnvshq.org Jawahar Navodaya Vidyalaya VIth class admission results. The Examination Results for Navodaya Schools will be released in First week of May. The CBSE board has conducted the admission test on behalf of JNV schools for 6th Class Admissions. Every year before six months of next academic year, JNV selection test is conducted. 3 to 5 lak students will participate for getting the free education in Central Syllabus. Each district in country has its own Navodaya Vidyalaya School. The complete education with accommodation is free of cost till their higher secondary in CBSE board. When are the JNVST 6th Class results are released? Currently the Admit card download and Preparation of examination process to be conducted on 10th Feb is going on. Students will get their answer keys after three days exams commenced. In the official advertisement three dates are given for three streams exams. Summer bound Jawahar Navodaya School result is declared on first or second week of May. For winter and Extreme Winter schools. Results are declared in First week and last week of June Respectively. So tentative date for Jnvst 6th class results 2018 to check is bet 1st to 7th may. It is very funny that being one of the biggest complex of education, JNV Navodaya has no single website. Every district school has its own website of blog for updates. But we have prepare the complete list Navodaya schools websites to check the results and downloading of admission letters. The main home page of JNVSHQ will be updated about the results and admission letters download. For example if a student have applied for Hyderabad District or Bangalore District, then he must look in Bangalore JNV School website only. The selected candidates list of all schools will be updated in the JNV website for download. Search for your hall ticket number among the list and if you have you no. wait for admission letter to received @ your address. The Navodaya Vidyolaya samithi did not release the 6th Class Admission test results 2018. But the lateral entry for the selection test 2018 into the schools of Tarn Taran, Chamba, Jaunpur, Dhanbad, Kathihar, South Dinajpur. This exam was to be conducted on 15th July 2018. This is called Phase 2 JNVST Results 2018. Please check the online application and hall tickets link. Recently the Navodaya website was updated with the Phase II exam schedule and Navodaya results 2018 release date. The exam was to be conducted on 15th of July 2018. So the exam results and selection list will be declared after one week. On 21st July the Navodaya website was updated from nvshq.org to navodaya.gov.in. In this new web portal Navodaya Selection list of Chandigarh, Madhya Pradesh states Selection list was displayed. The selection list was updated with final shortlisted roll numbers of students district wise in two states. Each school was filled with 50 students. Download the document to check the result. Sir please batainye class 6 th ka jnvs ka selection test ka result kab niklega. hi sir iam from bangalore please tell me the results date. My son's name is sahil pardhi his role no. is L11903 . I'm unable to find his 5th navoday exam result please help me . No useful information keeps/ makes you going round and round. Please, result my brother Abhisekh malakar..
Sir. Thanks for the information in your website. We parents of children are very concnerened about the Navodaya Selelction list and JNVST Results 2018. Please help us to check the exam results and marks list sir. very worst till date no results how do you think and justify kids future you people are just playing kids life and future. please results are getting delayed. But the information provided in this website is very time to time updated. 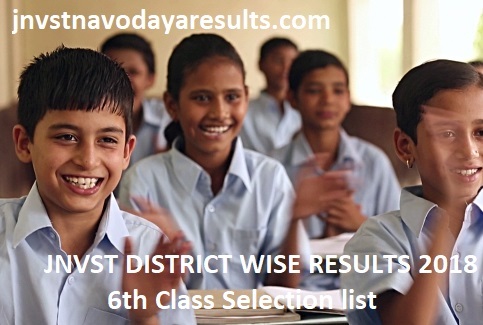 With reference to above mentioned 6th class results and selecting list on district wise. I want to know when the result are going to out and on which link you will issue? This information is correct that on first week of May the result are going to come? if yes please ping me as a conformation or not please tell me the correct date. Is this true the you are providing free of cost education of student with free accommodation? Why because in our district some many children are poor. If you fulfill this then we will be a great thankful to you. When will be the result of Telangana state and please menton the date of it? Right now am in Mumbai state can i apply form here for Hyderabad district or for the Bangalore? and what is the last date of applying ? Why CBSC is conducting admission test on behalf JNV? And is there free education to students? As you have mention in the your website (above) ? Will CBSC student get free studies with free accommodation till higher class? OR should we have to pay for it in Hyderabad? I have clear the entrance exam and am pass in that but when i checking in the list of selection list in the state of Hyderabad its not showing my name may i know what’s the reason behind this?